[SOLVED] Openbox - Keyboard Shortcuts in rc.xml - how to keymap to move to a different workspace? SOLVED: I did not remap keys. I am new to arcolinux, and love the idea of the progression in phases. Currently I am in phase 1, moved on from xfce to openbox. 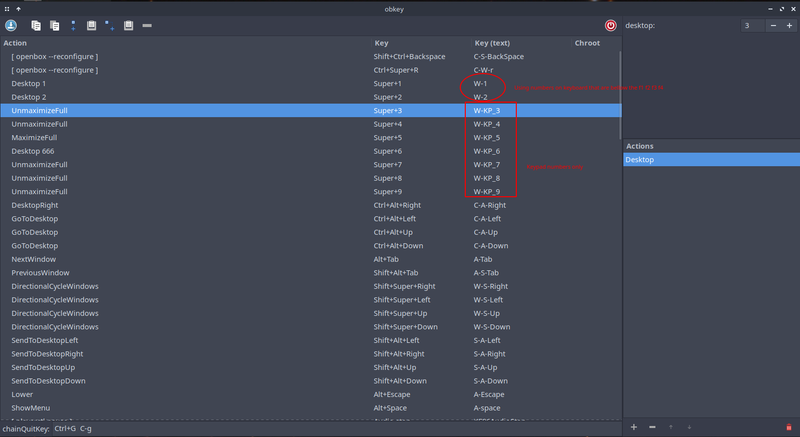 I would like to have my hotkey Super+1 go to Workspace one. I am using the GUI editor and running into issues. I restart openbox and still the hotkey does not work. Last edited by julientm on Thu Mar 28, 2019 7:17 am, edited 1 time in total. Re: [OPEN] Openbox - Keyboard Shortcuts in rc.xml - how to keymap to move to a different workspace? Remember to save at the top left. We want our keyboard shortcuts to be the same in all 13 desktops. Thank you Eric for such a fast reply. It worked! My mistake was that I did not remap the keys from the numberpad to the keyboard. Notice in my screenshot the difference in the Key (text) column. I am careful not to change the shortcuts often because they are the same in all Arco versions.